The Frame Gripper helps you easily remove hive body and super frames from your beehive when you have frames that are stuck to the side of the hive or to other frames. The frame gripper is one of the most handy tools for beekeepers. It helps beekeepers easily pull frames from their hives for inspection or extraction. This is particularly helpful for those who have large hands or have difficulties pulling sticky frames apart. The difficulty of separating frames is caused by buildup of propolis (essentially really hard beeswax). The propolis essentially cements parts of the frames to the side of the hives or other frames making it very difficult to separate. While this tool isn't an absolute essential (like the hive tool or the bee suit), it makes beekeeping so much easier. By the time beekeepers have inspected a hive full of frames, it's common that hands and fingers are sore and fatigued. 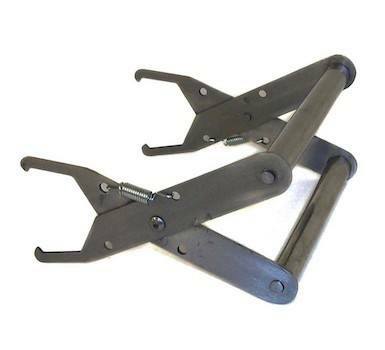 The Frame Gripper saves beekeepers pain and exhaustion caused from having to manually remove frames from their hives. All beekeeping suits and tools are eligible for shipping or local pickup. Shipping prices are determined by distance + package weight and ﻿dimensions﻿. For accurate shipping prices, please refer to the shipping calculator at the end of the checkout process.